GAINESVILLE, FL: It is rare that an alumnus returns to campus and announces that they have been with the same company since graduation. But since graduating from ISE in 1990, Ellenberg has been with Southern Bell, Bellsouth Mobility, Bellsouth International, Cingular and now AT&T Mobility — essentially all under the AT&T network — due to the regulatory changes in the telecommunications market over time. 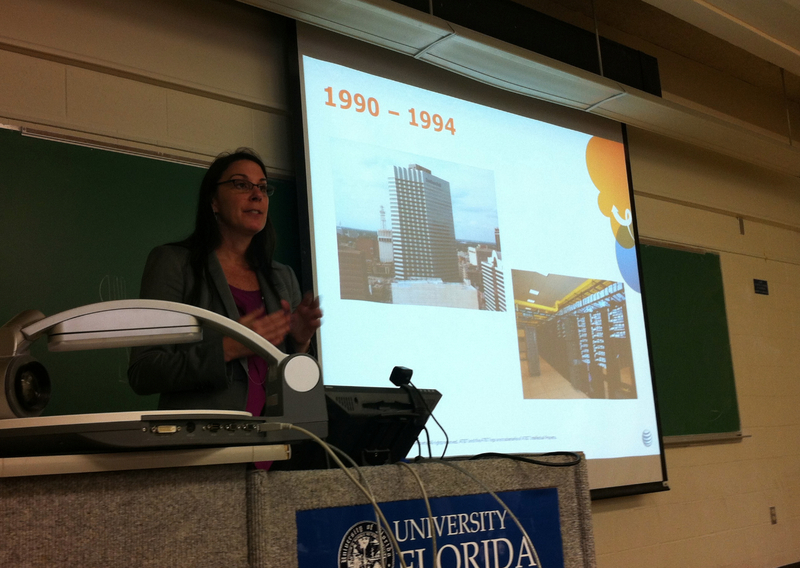 Ellenberg addressed students in the “Introduction to ISE” class on Monday, April 1, about her career, which has taken her from being an equipment engineer on land lines to negotiating network contracts throughout South America, to signing a non-disclosure agreement with Apple when meeting with Tim Cook (then Apple’s COO) about launching the iPhone. Surprisingly, Ellenberg had no intention of pursuing an engineering degree in college. She first went to school in Jacksonville with the hopes of one day running her own dance studio. But a summer job in Lakeland working with children in Parks and Recreation soured her on working with children in the future. Upon returning to school, she talked with her guidance counselor and identified engineering due to her strength in mathematics. And she thought the combination with business was a good career move — one that she followed by completing her MBA at Nova while working.